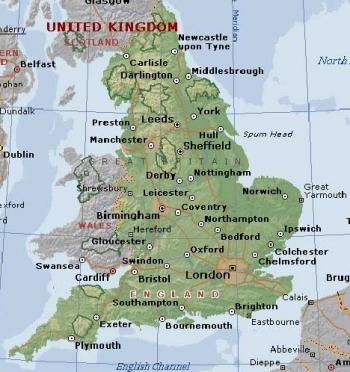 England is the largest and most populous country of the United Kingdom. Its inhabitants account for more than 83% of the total UK population while its mainland territory occupies most of the southern two-thirds of the island of Great Britain. England shares land borders with Scotland to the north and Wales to the west and elsewhere is bordered by the North Sea, Irish Sea, Celtic Sea, Bristol Channel and English Channel. The capital is London, one of the largest urban regions in Europe. Like much of the UK, England offers rugged coastal scenery and picturesque historic ports. The UK Hydrographic Office produces 'Admiralty' charts for the whole of the UK (and the world). These are available in 'Leisure Folios', with the UK covered by 22 folios each containing around 17 charts. They are priced at around £40 each. Charts can also be bought individually. The UK is at the junction of 4 different weather systems, which makes it very unpredictable. Winter tends to vary between and cold dry with frost little wind to slightly warmer with rain and wind which makes it seem colder. England generally gets about 1-3 days of snow in the winter. Spring can vary between glorious sunshine to gales with everything in between. Summer is more stable, with either weeks of wonderful weather, or weeks of rain! The autumn is much the same but quite often keeps fairly warm right up to December. The UK Shipping Forecast, broadcast on BBC Radio 4, gives a general overview of the conditions in 31 regions detailed UK shipping forecast zones. As of 7/2012 the frequencies are 198 kHz LW and 92-95 MHz and 103-105 MHz FM, and the broadcast times are 0048, 0520, 1201 and 1754. The 0048 and 0520 broadcasts are followed by a detailed Inshore Waters Forecasts. The 0048 broadcast famously concludes with the National Anthem! The Inshore Waters Forecast is available from the UK Coastguard. The forecast is given at intervals throughout the day, following a brief announcement on VHF Ch.16 of the working frequency for the relevant region. Details of all UK Maritime Safety Information broadcasts are available Maritime Safety Information leaflet. No cruiser nets (as far as I am aware). VHF CH 16 is used to call but must not be used other than to establish contact. Excellent access to the coastguard on CH 16 in all areas. Emergency assistance is available via the coastguard service and is provided free of charge including Lifeboat or helicoter rescue. If you sail up the English Channel, keep clear of the Scilly Isles unless you have detailed charts, the sea is shallower here and can be very rough in a blow. If you have the charts, the islands are well worth a visit. The English Channel is a busy commercial waterway and in many areas Traffic separation schemes (TSS) exist for commercial shipping - these are shown on the charts. If crossing these try to do so at right angles to the traffic flow. It is vital that you maintain a good lookout at all times as there are also many fishing vessels working the area, including pair trawlers as well as the larger ships. If you decide to go up the Bristol Channel, note that there are few refuges and that the currents can be fearsome. Due to the funneling effect of the channel this area has the second largest tidal ranges in the world (approx 15 metres). This is one area that with careful planning, monitoring the weather forecast and good seamanship you can enjoy some of the best sailing available. In the upper reaches of the Channel fully corrected, up to date charts, accurate tide tables and tidal curves are essential. A boat that can take the ground can be a distinct advantage in most moorings. Along the east coast, sandbanks such as the famous Goodwin Sands are common and have caused the wrecking of many vessels. The prevailing winds often produce leeward shores on the south and west coasts, which when combined with the unpredictable weather and strong tides demand respect. Numerous small ports offer a safe haven for small vessels. For a wider appreciation of navigational conditions, see United Kingdom. If you have a pet dog I suggest you leave him/her home, the customs are very hot on rabbies prevention. Any dog coming into the UK has to go into 6 months quarantine unless it has a pet passport detailing that it has all the necessary vacinations etc! We're all pretty healthy here. If you need medical treatment, the National Health service will provide it. Theoretically, non-nationals should pay for treatment but in many cases they are never asked to do so. Plymouth is probably the easiest to get into if you're coming from the west, just head for the Eddystone lighthouse and you're just 20 miles away. Falmouth is a little further to the west but prettier, more of a holiday town. If you're coming from the south, keep to the seaward side of the Manacles rocks, there's some hidden dangers there if you don't know the waters. Just remembered, the small harbour of Looe is well worth a visit it's very pretty, and typifies that part of Cornwall, but it does get very busy with hoilday makers in the summer. Further east is Salcombe, very beautiful, but be careful when enter at low water or at less than half water if there is a sea running, there's a bar across the entrance and a good possibility of grounding. Further round there's Dartmouth (with 3 marinas)- very beautiful entrance particularly in the evenings but busy, Torquay (with a marina)- a busy holiday town,and Brixham - a fishing harbour and Marina. Avoid Teignmouth, a less busy holiday town, the approach is poor and it's probably the least desirable spot to stop. Exmouth, just around the corner has a difficullt approach, strong currents, lots of mudbanks and virtually no facilities even if you can find somewhere to anchor. Further east is Weymouth. Plenty of pubs and clubs, it even has a theatre. Then there's the Isle of Wight and the The Solent. Keep the Needles to starboard and stay in the channel! If you can time it; come in with the tide, it races through here at about 8 knots. There's a double high tide in the Solent too. This means the tide runs eastbound for about five hours, stands or goes out a bit then comes in a bit for about 2 hours, then rushes westward for the next five hours. The Needles Channel is the narrowest bit and this is where the strongest current is. Once you're in The Solent, there are almost immediately two harbours choose from Lymington on the mainland, and Yarmouth on the Isle of Wight I prefer Yarmouth but both are worth a visit. Be careful crossing in a strong current, keep your engine running just in case you get carried past the entrance. Other places to visit are Newtown Creek - this is a nature reserve and you need to use your anchor here, but there's a pub a mile up the stream if you fancy a long row. Bealieau on the mainland is next - motor up to the Bucklers Hard & visit the Maritime Museum - fascinating. Cowes of course, on the Isle of Wight, is the centre of yachting - excellent shopping for all kinds of maritime things. Back over on the mainland is the major port of Southampton. If you want to visit, you can use the town marina or turn right just before you get there and moor in the River Hamble, this is the busiest river for all kinds of leisure boats and really is a must. Next along on the mainland is Portsmouth - full of navel history, a tour round HMS Victory is obligatory. Finally across on the Isle of Wight is the beautiful Bembridge which is only accessible at high tide. Oh and by the way, there are three forts guarding the eastern entrance to The Solent, built to keep out the French during the Napoleonic wars, and one of them has been modernised, see of if you can spot which one. Once you leave The Solent, the next place to visit is Chichester harbour, be careful of the shallow entrance at low water, and keep to the channel. Its very beautiful here - another nature reserve. The next big harbour is Brighton - easy to get in. The marina is on the outskirts of the town so not too crowded, but a short bus ride or walk into the town. Lovely resturaunts. List transportation to other countries, etc. Submit details/contacts of cruiser's "friends" that can be contacted in advance or on arrival - who can offer information and assistance to our cruising "family". This page was last modified on 12 September 2018, at 21:57. This page has been accessed 33,778 times.